"Our 5 y.o. son with Aspergers [high functioning] can be very aggressive when he's frustrated. He's not beyond attacking whoever is the closest to him at the time, especially his playmates and siblings. He will push, spit, hit, kick ...and it's uncontrollable once his anger reaches that level. Any suggestions?!" Few situations are more difficult to deal with than having a youngster who is aggressive toward other kids. It can be embarrassing as well as frightening when your Aspergers (high functioning autistic) youngster bites, hits, scratches or kicks to get his or her way. It’s not uncommon for younger Aspergers kids to engage in this type of behavior at various points in their development and in a variety of settings. However, when it becomes very frequent or seems to be their consistent way of reacting to something they don’t like, it’s time to step in and help them change their behavior. The first step is understanding the underlying reasons why your Aspergers youngster is choosing to act out this way. The more you understand what’s happening, the better you’ll be able to help them find other, non-aggressive ways to solve their problems. • How is his aggressiveness expressed? Is it through angry words or through angry behaviors? Does he become verbally aggressive first and then physically aggressive, or is his first response to strike out and hit? 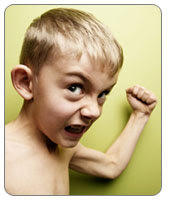 • What seems to cause your youngster to act out in an aggressive fashion? Is it triggered by frustration, anger, or excitement? Notice if there are patterns. Does he act this way when toys are involved, and he’s frustrated about sharing? Or does he become aggressive when there is too much going on and he’s over-stimulated? If you observe the situations carefully, you will likely notice patterns. • Who does my youngster hit, bite or kick? Does he do it to one friend in particular? Does he only do it to me? Or does he tend to be aggressive with whomever he is with? If it’s one person in particular, try to find out if there’s a reason why he’s attacking that youngster such as engaging in overly aggressive play, a poor match of temperaments or a lack of clear cut rules before play begins. By answering these questions, you are on your way to successfully limiting your youngster’s aggressive behavior in the future. In this article, I’ll outline some ways that you can help your youngster become more aware of his aggressive feelings and teach him to calm himself down, or find alternative ways to solve his problems. We’ll also talk about giving consequences to kids when they do lash out and hurt someone. In my experience, consequences are imperative to ending aggressive behavior in young kids. They teach your youngster that all behaviors have a consequence, whether good or bad, and will help him make better choices in the future when he is with his friends. Once you’ve narrowed down the reasons why your youngster is behaving aggressively, it’s time to intervene. At the first sign that your youngster is about to become aggressive, immediately step in and remove him from the situation. Be careful not to give too much attention to your youngster so that you do not give any negative reinforcement for the bad behavior. Too much attention can include trying to “talk through” the problem. Young kids are not able to hear long explanations of why their behavior was offensive. A simple yet firm statement such as, “We don’t bite” should suffice while you turn your attention to the victim. Other examples of too much attention include yelling at your youngster while attending to the victim, forcing your youngster to apologize immediately or continuing to talk to the other moms & dads around you about how embarrassed or angry you are. Make a point of consoling the victim and ignoring the aggressor. If your youngster cannot calm down, remove him or her from the situation without getting angry yourself. When they are calm and ready to talk, you can discuss what happened. If it’s physically impossible to remove your youngster, you will have to remove yourself and the victim from the situation. By walking an age-appropriate distance away from your youngster after he has acted out, you are sending the message that you will attend to him when he can calm down. In doing so, you are teaching your youngster that it is his responsibility to learn to calm himself and act appropriately. As moms & dads, we need to show self-control and use gentle words if we want our kids to do the same. It’s easy to respond with yelling or anger, but remember, your youngster is looking to you for cues on how to control his impulses and have good behavior. While it can be terribly embarrassing to have a youngster that continues to act out towards their friends, keep in mind that their negative behavior is most likely happening because they are still navigating their way through their social circles. This can be very difficult for some kids, so try not to over-react or personalize it. For some kids this will work, and when your youngster returns to you, calm and collected, feel free to quietly praise him, saying, “Thank you for calming yourself down. We don’t bite. It hurt Josh and he is sad.” Repeat the phrase “We don’t bite” and inform your youngster that if it happens again, the consequence is that you will leave. If this does not work for your youngster and he simply cannot calm down, leave him where he is (again, at an age-appropriate distance) and ignore the tantrum. Most young kids will not continue to act out if they no longer have an audience. You can also teach your youngster how to count to ten until he is less angry, how to do deep breathing in order to calm down, or how to use his words by making statements such as “I am really, really angry right now!” All of these methods help take the immediate focus off of your youngster’s anger and teach them to recognize this important emotion. Before you enter into a potentially difficult social situation, review the consequences with your youngster about what will happen if he cannot control his anger. Tell your youngster, “I feel you can handle your anger, but if you can’t, we will have to leave the park and not come back until next week. Do you understand?” Make certain that you follow through with whatever consequences you pose to your youngster. Remember that you may have to repeat this rule numerous times, using the same words, until your youngster gets it. Be firm and consistent each time your youngster becomes aggressive. Have a plan in place for consequences if aggressive behavior starts. At home, this can include a time-out chair away from the rest of the family where your youngster can stay until he can calm down. If you are away from home, pick a safe place, such as a time-out in a car seat or another place where your youngster is removed from the fun. This reinforces that you are not tolerating aggression in any form. For older kids, those between 3 and 7, remember that they may be experimenting with cause and effect. In other words, they want to see what you will do when they act out. It’s your job to provide the consequences for the "effect" to work. Since older kids are more verbal, you can use a variety of phrases when they misbehave. Examples include, “Biting is not OK,” or “Hitting hurts others. You need to stop.” It is okay to tell your little biter/hitter/kicker that once he misbehaves, he’s lost a privilege for the day. Consequences can include leaving a play date immediately or losing video time. Many times kids who display aggressive behaviors simply lack the communication skills necessary to help them through a stressful situation. For a young youngster, biting or hitting someone is a whole lot easier! Plus, aggressive behaviors often give kids a false sense of power over their peers. • Teach your youngster to say “No!” to their peers instead of acting aggressively. Too often a youngster reacts negatively to a friend or sibling instead of asserting themselves. By using the simple word “no,” you are helping your youngster to get his point across verbally, not aggressively. • Give your youngster a series of phrases to use with their friends when they are feeling angry or frustrated. Some examples are, “No, that’s mine,” “I don’t like that!” or “Stop! That hurts.” This helps your youngster substitute words for striking out. Before you enter a situation that you know may cause your youngster to act aggressively (i.e., a play date or daycare) remind your youngster to “Use your words.” Repeat this to your youngster throughout the course of the week when you feel they are getting frustrated. This means knowing when to leave a potentially volatile situation or choosing to engage your youngster in a different activity to avoid aggressive confrontations. If you know that your youngster targets a particular youngster at play group, you may have to hold off going to play group for a few weeks until he learns to control himself. Or, if certain videos, games, or activities frustrate your youngster, remove them from your daily routine to see if this has a placating effect on your youngster’s behavior. Finally, if your youngster is exhausted, hungry, or over-stimulated, respect that and engage in low-key, slow-paced activities that will make aggression less likely. With your older, more verbal youngster, talk openly about situations that make him angry and work together to come up with solutions to help him through the problem next time. When you catch your youngster being good, be sure to praise their hard work and efforts. For instance, if you observe your kids in a power struggle over a toy that ends in them working it out peacefully with their friend, tell them how proud you are that they chose to use their words instead of resorting to aggression to get their way. Look for and continue to praise good behavior as a way to motivate your kids to do better next time. • Do not expose your youngster to violent television or video games. Too often TV and videos portray the most violent character as the hero, which sends the message that violence is a means to an end for problem-solving. This message can easily be avoided if you are on top of their viewing habits. While TV or video violence may not affect some kids, it may greatly influence others who have a tendency to act out aggressively with their friends. By knowing your youngster’s temperament and what he or she can withstand, you are helping them on their way towards their best behavior possible. • Do not personalize your youngster’s bad behavior. All too often moms & dads get frustrated and angry at their youngster when they are aggressive, because many times we feel that our youngster’s poor behavior is a reflection of our parenting skills. If you have an aggressive youngster, switch your focus towards helping them express themselves in a more appropriate way and follow through when an incident occurs. • Never bite or hit back. It can be tempting to want to teach your youngster a lesson in how it feels to be the victim of aggression, but when you succumb to a childlike form of communication, you are teaching your youngster that aggression is the answer to resolving a conflict. Even though it’s difficult, try your best to maintain your composure. It is important to recognize that all young kids may exhibit any or all of the above problems at some point during their development. However, if your youngster persistently displays these behaviors and it affects their daily functioning, such as their ability to behave at school or maintain friendships, contact your pediatrician, as it may indicate that they have other psychological problems that need attention. In this case, you will need to have your youngster evaluated by a mental health professional. Parenting an aggressive child with Asperger Syndrome can be one of the greatest challenges you will face as you weave your way through the maze of his or her development. Even though it may seem like it at times, it’s not impossible to teach your youngster new and appropriate ways to interact with other kids and the adults around them. The key is developing a clear, uncomplicated, consistent plan and following it in a composed manner. Remember: the best example of appropriate behavior is you, and your young kiddo is watching. This is such super advice--all teachers and parents should read this. I'll tell you a little bit about my 15 year old son. His name is Preston and was diagnosed with autism PDD at the age of 4. I still think to this day he has aspergers but the doctors don't seem to think he does. Alot of people do not think he has a disability because he speaks very well and can be very well mannered with strangers. The only problem we have with Preston is he is very agressive towards us. Sometimes will act out at school but very rarely. He has no friends so this frustrated him alot, so he will never defend himself to other kids cause he wants their friendship so bad, but doesnt know how to act with them, gets really nervous and tends to say rude things sometimes, so noones wants to hang out with him. So we are the ones that he takes his anger out on. His temper is so bad he hit us everyday, and he is a huge boy. We've tried medications but they only seem to make him worse so I am now weaning him off. The hitting usually happens because he cant have his way, or if you try to talk to him about his behavior or something he is not suppose to do or cant do. My question is, I really want to start your program but I am a little scared, because as soon as I will say no, he will hit me , and If I take something away this will really piss him off. I am alone at home with him cause my husband works out of town for now. I really want to do this, because we give in often because we dont want him to hit us, or do this when we are out. An example is tonight at my moms I asked him to say thank you for something, he wouldn't so I asked him again he gave me the finger, should this be ignored or should I say something? I ignored it. I get called names also, should this be ignored or is this when I mention the consequences ? What I do now, when he starts to get mad, I do try to calm him down but sometimes I cant he just says so many mean things and becomes this evil person, I usually try to ignore or even leave sometimes. He will not do chores, brush his teeth, help anywhere in the house, just wants to be on the computer all day.It is very hard to dicsipline him. We are at the point we do not know what to do anymore, Ive even looked in special schools, but that is not how I want to deal with this. I don't want to give up on him. He loves doing movies and making his own music on the computer and watching movies. Oh and food, we fight alot about that to. I want to try your program so bad, but Im a litlle scared. When I found your site I just had to order it and figured this is our last option I think. I started reading it right away and pretty much cried the whole time, I would love this to work. We are a very close family and he is my only son and my parents only grandson, so we love him so much but hate to see him like this. He does admit he has a problem with his temper and this bothers him alot. You just described my 13 year old boy. I wonder how many there are in this situation. I know the school wants to remove the PDD Dx. For your son the experience of biting is probably not a negative one, so maybe try to find a way to make it negative for HIM so that he's discouraged. My 11 yr old loves computing and has films on his computer too, so his 'punishment' is making him come off his computer (at bedtime) 5 minutes early for each time he repeats the negative behaviour. So if he repeats four times then it's 20 minutes in total. He reads instead but knows his choice was taken away because of his behaviour, and he also learns about consequences in life for his actions with regard to other people. what isn't mentioned but I've found very helpful is this... with HFASD they have an "emotional age" which is 2/3 of their chronological age. Which means my 9yr old is only 6 years old emotionally... so, when I'm helping him deal with the tough emotions I imagine him at 6 before I open my mouth. This little conversion has helped me find a lot of ways to help "in the moment" and it's so much less frustrating for him. You wouldn't expect them to be able to handle the same pressures at their emotional age as their chronological age... i feel sure this is one of the reasons they resort to violence!! Something not listed that's been very helpful for me is that HFASD kids have an emotional age that's 2/3 of their chronological age. This means a 9yr old is only 6yrs old emotionally, but dealing with the pressures of a 9yr old. Do the math (age multiplied by .67) and then grab a picture of your child at that age - remember that is how old they are emotionally, figure out how would you help a child that age with the current pressures, and you'll be able to diffuse them a lot more often. I think this gap is why the violence is so common.